Whether you are an aspiring League of Legends professional, or a Call of Duty luminary, one thing is for certain – you need a professional gaming mouse. If you don’t invest in a serious gaming mouse, then you will be at a huge disadvantage and it will reflect on your score – poorly, I might add. If you skimp on gear, but choose to get the sweetest GPU, the most power-hungry CPU, the fastest SSD and the best full HD monitor – then you have no excuse. Take a look below on how to choose a gaming mouse and our short, but sweet, list of professional gaming mice. Take a look at our Top 5 Best Mechanical Keyboards for Gaming list on how, and what to pick keyboard-wise. To be frank, it seriously depends on what you are going to use it for. Are you into FPSs a la Call of Duty, Battlefield and Blizzard’s new OverWatch? Then you’ll need to find a mouse with the perfect balance of responsiveness and sensitivity. This means that you need to take into account its DPI rating. You might fancy RTSs, RPGs, or MMOs. It’s vital that you pick your mouse accordingly – a gadget that has a ton of macros that you can map to be triggered by certain actions like spells, buildings and such. We’ve done our darnedest to pick the very best gaming mice for professionals and newcomers alike – whether it is for completing your ultimate Mac or PC gaming setup, is up to you! With a classic design and an insane amount of DPI, the Razer DeathAdder Chroma is the #1 in our list because it’s #1 in our hearts. It has 10.000 DPI, 5 buttons, it’s ergonomic and it has an always-on mode. Its textured rubber side grips are fantastic, and the Chroma lighting is to die for. When you add 1000Hz ultrapolling in the mix everything just gets bonkers. Unfortunately, it doesn’t have any macro buttons and from a design point of view it looks like a pleb gaming mouse. Professional gamers are in love with everything Razer makes for PC, and the Death Adder Chroma Mouse is one of the best Razer mice I have ever seen. Don’t expect anything flashy – it feels just right in the palm of your hand, it’s light and the rubber side-grips are useful when you encounter more agitated moments in-game. The Death Adder’s optical sensor is insane and it will more than please the FPS addict. However, MMO gamers will steer away from the Razer DeathAdder mouse mainly it doesn’t have any macro buttons whatsoever. The Roccat Kone XTD mouse sports the same bland design as the Razer DeathAdder, but with a little touch of panache. It has fewer DPI – as in 8.200; and it comes with 8 buttons. It features an ergonomic design and it has a polling rate of 1000Hz. With plenty of buttons and a fast response time, it’s a serious contender to the throne. However, it has a gimmicky software. It has a built-in 32-bit proc and it analyses your mouse-pad automatically to ensure the best gaming experience. To be honest, it’s one of the most technologically capable mice on the market. 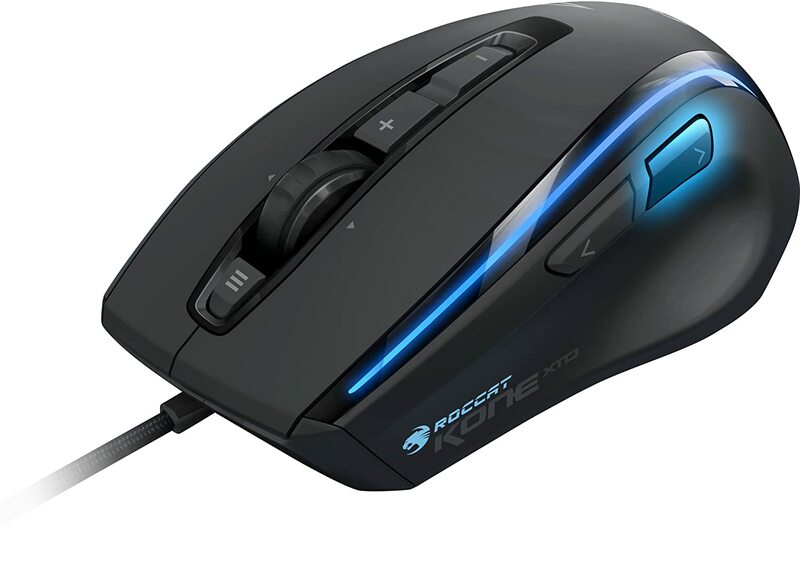 Any serious MOBA, RTS and MMO gamer already owns the Roccat Kone XTD. It’s also great for the FPS scene, but the Razer DeathAdder and its 10.000 DPI is better. A small rat indeed, but a feisty one. The Mad Catz mouse is scrumptious. It has fewer DPI – 6400; than the previously discussed gaming mice, it’s wireless and it features 12 buttons, of which 10 are programmable. The built-in Bluetooth is reliable, and the adjustable grip works like a charm. However, it’s petite and designed to fit smaller hands. You could call the Mad Catz rat a typical laptop mouse. But don’t take that as a bad thing. It packs more than decent specs for such a tiny gaming mouse. It can run five macros because of its smart four-way button scheme. It’s seriously not for FPS pros, but MMO and MOBA gamers should take a look. The SteelSeries Sensei packs 6400 DPI with 12 built-in buttons – of which 10 are programmable. It has a 31-bit ARM CPU, and it can track movements up to 150-inches per second. Did I mention that it has an LCD display as well? With 8 handy macro buttons and a highly customizable lift distance, the SteelSeries Sensei is a worthy gaming mouse for MMO, RTS and MOBA gamers. Yet, I found the SteelSeries Sensei to be my perfect match when it comes to shooters – at least, for me. Sure, professional will ponder what to buy between the Razer DeathAdder and the SteelSeries Sensei Raw. The SteelSeries Sensei Raw is a cheaper – but not by much; cut down version of the classic Sensei. This means that it comes with almost all of the Sensei’s features and capabilities, but it removes the 32-bit ARM proc and the LCD display. It handles impeccably, regardless if you have illusions of professional gaming grandeur or not. It’s worth considering if you plan on acquiring a rather cheap gaming mouse. 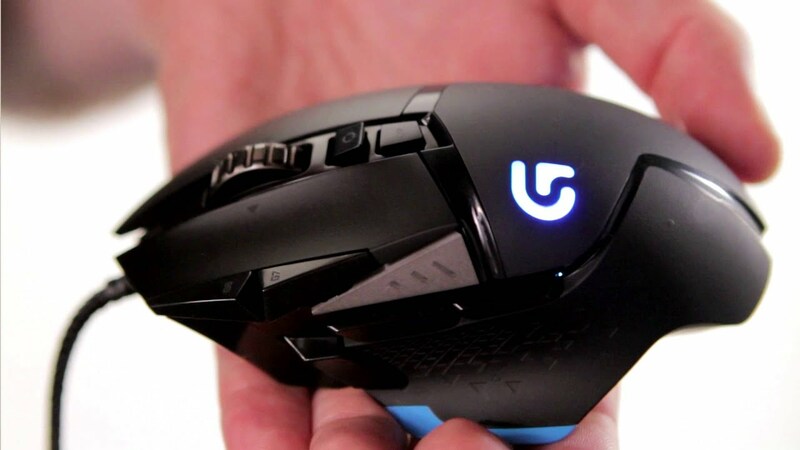 The Logitech G502 Proteus Core is a fantastic gaming mouse for those of us that need to feel something heavy in the palm of our hands when gaming. It has five weights built-in that are totally removable, so if it feels too blocky for your taste, then you can get rid of some. Its in-game DPI shifting – 200-12.000 DPI by the way; makes it compete with the awesome SteelSeries Sensei Raw and Razer DeathAdder. It has 11 fully programmable macro buttons and 3 on-board profiles so you never lose your settings – switching from Tank, to DPS to healer takes a toll on any MMO pro. Build materials are exceptional – and that’s an understatement.